Common celandine, also called greater celadine to distinguish it from lesser celandine of the buttercup family, is a member of the poppy family found throughout North Africa, Europe and parts of Asia. The 19th century poet, William Wordsworth, was so fond of the herb that he commissioned an artist to engrave its star-shape on the entrance to his tomb. In herbalism, the aerial parts of the plant are used to make poultices, salves and ointments. Celandine belongs to the same family as the Poppies (Papaveraceae) and has, like these flowers, a dense mass of stamens in the center of its blossoms. The Celandine is an herbaceous perennial. The root is thick and fleshy. The stem, which is slender, round and slightly hairy, grows from 1 1/2 to 3 feet high and is much branched; at the points where the branches are given off, it is swollen and jointed and breaks very easily. The whole plant abounds in a bright, orange-colored juice, which is emitted freely wherever the stems or leaves are broken. This juice stains the hands strongly and has a persistent and nauseous taste and a strong, disagreeable smell. It is acrid and a powerful irritant. The yellowish-green leaves, which are much paler, almost grayish below, are very thin in texture, drooping immediately on gathering. They are graceful in form and slightly hairy, 6 to 12 inches long, 2 to 3 inches wide, deeply divided as far as the central rib, so as to form usually two pairs of leaflets, placed opposite to one another, with a large terminal leaflet. The margins of the leaflets are cut into by rounded teeth. The flowers drop very quickly when picked. They are arranged at the ends of the stems in loose umbels. They blossom throughout the summer, being succeeded by narrow, long pods, containing blackish seeds. The English name Celandine is derived from the Greek word chelidon (a swallow), because it comes into flower when the swallows arrive and fades at their departure. Chelidonium majus is native to Europe and western Asia and introduced widely in North America. Found by old walls, on waste ground and in hedges, nearly always in the neighborhood of human housing. Celandine can grow in full shade (deep woodland) semi-shade (light woodland) or no shade. Celandine prefers moist, rich, woodland soil. Sow seeds outdoors in February to May or August to November. Germination usually takes place within 1-12 months. The plant self-sows freely and should not need much encouragement. Division not recommended. The plant is harvested in the spring as it comes into flower, it is best used fresh, but can also be dried. The roots can also be used; these are harvested in the autumn and can be dried for later use. After drying the flowers and stems, cut into smaller pieces and store in an airtight container in a cool, dry place. Research thoroughly before handling this plant. Celandine is toxic and should be used with caution. 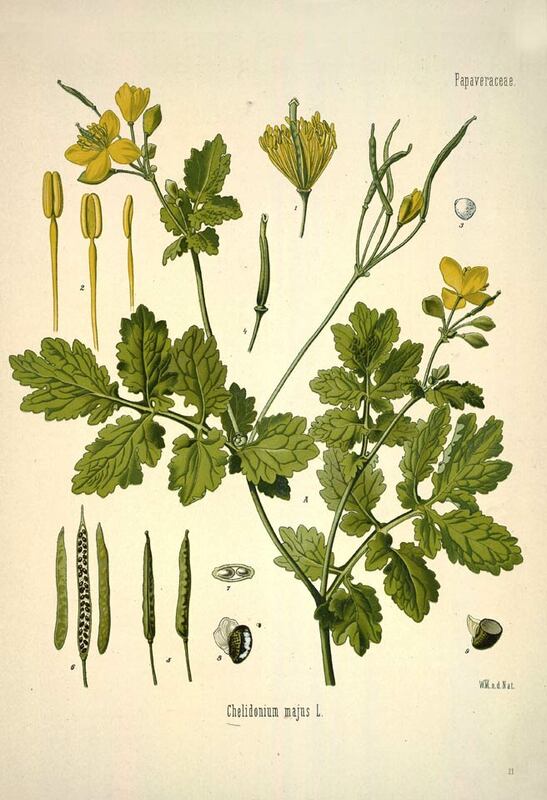 Celandine (Chelidonium majus), also known as tetterwort, is a perennial, flowering plant related to the poppy. Although the poppy family (Papaveraceae) consists of numerous plants, trees and shrubs that are considered “cosmopolitan” because they thrive just about anywhere. Celandine is the sole member of its genus. Note that this herb should not be confused with lesser celandine (Ranunculus ficaria), which is a member of the buttercup family. 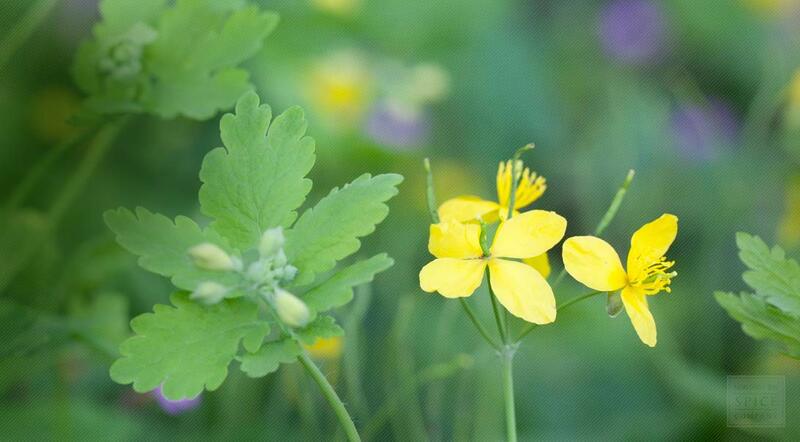 To further distinguish between the two, C. majus is commonly referred to as greater celandine. Like its cousin, the California poppy, celandine contains a number of isoquinoline alkaloids that make the entire plant toxic unless its compounds are prepared and administered in therapeutic dosages. Specifically, celandine contains the protoberberine type alkaloid coptisine, in addition to berberine. The plant also contains sanguinarine and chelidonine, which are benzophenanthridine type alkaloids. However, these agents do exert potent and beneficial pharmacological activity. In fact, these compounds have demonstrated analgesic, antimicrobial and sedative properties.